Here's your challenge. 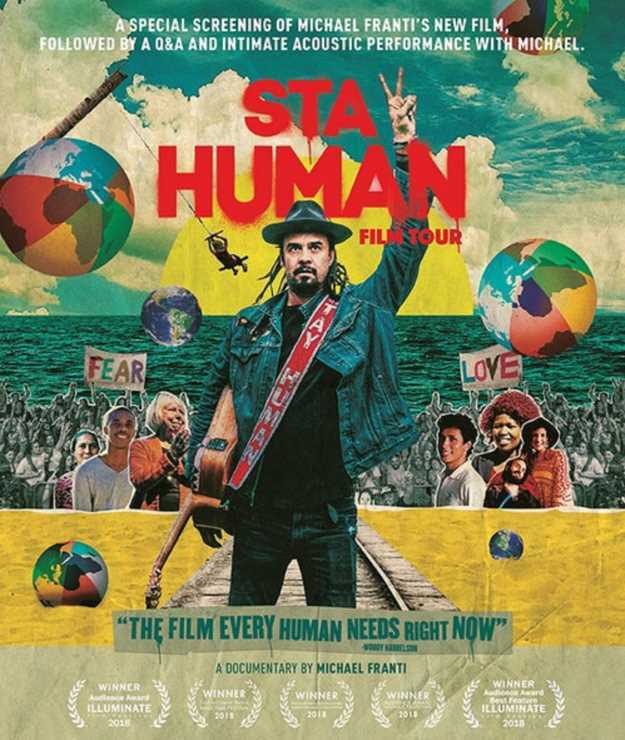 Whether you're a die-hard Trump-hater or a rocksteady wall-builder, I dare you to watch musician Michael Franti's documentary Stay Human without transforming into a cynical troll at any moment. I will admit, I failed within five minutes, but that's more a testament to how I've succumbed to this toxic national discourse and that's on me. In Stay Human, Michael Franti examines the idea of staying human in these times when we've all embraced cynicism and fear over the optimism and potential of the human spirit. This is the misanthrope's first challenge, which is to not immediately write off Franti as some kind of New Age bleeding heart. It starts with his self-examination of what it means for him to "stay human" while not letting fate beat him into submission. Taking a camera-crew on his world travels, he presents individuals and groups who are dedicated to making real changes in the world. Robin Lim is a human, who took it upon herself to serve strangers in times of great natural devastation. She is a midwife by trade but a humanitarian in spirit. In 2013, typhoon Yolanda devastated Tacloban, Philippines, virtually destroying the city. Robin went it and provided her services for mothers who were about to give birth to days following the event, probably saving numerous unborn infants. Not only did she establish birthing centers in nearby town, but also built makeshift schools for local children. Steve and Hope Dezember are humans in the fight of their lives. Steve is in advanced stages of Lou Gehrig's disease. He is supported by machines to help him breathe. He's so weak, he can't make sounds when he talks. His wife must read his lips so he can communicate. In spite of his physical challenges, his desire to live a full life is his driving force. His wife, Hope, stands by him as his physical and moral support. Their story reminded me of why we enter relationships like marriage and parenting. It's these relationships that force us to extend our lives to another person when in need and vice-versa. "Taking a camera-crew on his world travels, he presents individuals and groups who are dedicated to making real changes in the world..."
Arief Rabik is an innovative environmental entrepreneur in Indonesia. A country whose deforestation practices has weakened one of the Earth's much-needed supplies of oxygen. Arief and his crew have taken the challenge to revolutionize Indonesia's lumber industry by proving that bamboo (one of the fastest growing trees in the world) can be converted to lumber thus becoming a viable material for building houses. From South Africa, Busisiwe Vasi and Sive Mazinyo are students at the Ubuntu Education Center and are examples of people who refuse to let their situation dictate their future. The center is the product of South Africa's rebirth after apartheid. The center's mission is the belief that an education is vital for a better life. Busisiwe sold herself just to exist from day-to-day. Not wanting to live like this anymore and for the sake of her child, the Ubuntu Center taught her life management amongst other skills. The same held true for Sive, who is a teen determined to make a better life. He has hope, "Don't let your birthplace determine your future." Interwoven through these inspiring stories is Franti's real-life tale. He was adopted as a child because his mother wanted a better and stable life. His adoptive parents loved him and his brother, but their life was not perfect as his adoptive father was an alcoholic (this story has a happy ending). 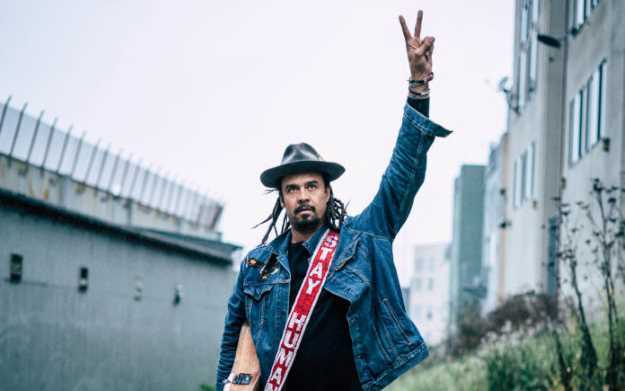 During the filming of Stay Human, Franti would be faced with his own challenges including a severe knee surgery, his mother's sudden stroke, and news about his college-age son. We see first hand his unexpected struggle to "stay human" himself. How's your challenge going? It's hard not to roll your eyes at times as Franti dumps a giant bucket of feel-good optimism over your head. And maybe that's exactly what we need once in a while, and that's exactly what we get. Can we, humans, change the world? There are hundreds of thousands understaffed charities around the world, and in your neighborhood, that could use another body to solve real problems like homelessness, education, healthcare, and the environment. So while Don and Nancy are bickering thousands of miles away, there's a spot waiting for you. I plan to make the world a better place right here and right now...just after I tweet this review, watch a few more films, wash the car, post photos of my dinner, and rant about this divided nation on my Vlog. I should have time right after that.